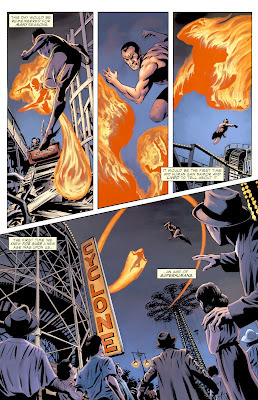 Tales From the Chatroom: Dear Pietro..
Tonight in chat, Kalinara and I realized that even though Scott Summers and Pietro Maximoff have so much in common that writers swap them during Alternate Timelines and What-Ifs and they were effectively counterparts in the Silver Age, but they interact much more rarely than they should. Then it occurred to us that they must be penpals. How are you? I'm fine. The Professor just developed an evil split personality and tried to kill us. Or something. I admit, I don't quite follow. On the plus side, he mind wiped your dad, so you should get a few weeks of vacation out of the deal. I have to go, he's trying to kill us. See you soon. I'm glad you're well. So am I. I am deeply impressed that you can tell the difference between an evil split personality of Professor Xavier's and his typical machiavellian plotting. Thank him for the memory wipe, as it allowed Wanda and I to finally have a quiet Thanksgiving. It's possible you will get a package from my former father-in-law. It is advised that you do not open it. Have a happy holiday. Thank you for the warning. Enclosed is a magnetic bumper sticker backing that should provide some amusement next time you encounter my father. Happy New Year. How are you? I don't know if you've been watching the news lately, but we have a de-aged and amnesiac version of your father staying with us. He apparently is hitting it off with Rogue. Gambit is annoyed. It's vastly entertaining. Hope things are going well with you. As always, I am pleased to learn that Father has lost his memory. Today I ventured across the Island of Dr. Moreau Players production of Camelot. There is talk of some sort of scientific Grail Quest. I'd forgotten how little sense life makes at home. How are you? I have unfortunately been trapped into working for my father again. I have been successful in curtailing his plans for light genocide this week, but this fixation with robots troubles me. Send Jean my well-wishes. I'm fine, how are you? I've sent you a package of electrical engineering text books. Use as you see fit. Jean is dead again, but I'll transmit your wishes when she comes back. I am doing much better since receiving your gift. Father is rather upset about it. My condolences on Jean. I would like to attend the funeral, but am too busy preventing my father from murdering too many members of his Cabinet. Please accept this wreath and apologize for my absence when she returns. If someone comes to your door saying it is me, do not open it. I have been possessed by Apocalypse. DEATH TO ALL UNWORTHY!!! I am going to take a vacation on a fishing vessel. TREMBLE BEFORE ME MORTAL. Please tell Wanda I said hi. DIE INFIDEL. Best wishes. Have relayed your greeting to Wanda, as well as your warning. Good luck with the possession. I am told that the trick is not to isolate yourself but to surround yourself with people who care for you, but I don't know anyone with a heart who has actually tried this. I certainly wouldn't risk my sister in such a way. HOW ARE YOU? I HOPE THINGS ARE WELL FOR YOUR SISTER. HAVE YOU EVER THOUGHT OF A NEW CAREER ON LIFE? I HAVE A JOB OPENING AND YOU WOULD MAKE A GOOD PESTILENCE. I move far too fast for pestilence. My father, on the other hand, is a plague upon the entire species. Contact him. HOW ARE YOU? YOUR FAMILY IS A SCOURGE AND A BLIGHT ON THE PLANET. ALSO YOUR SISTER WILL NOT RETURN MY CALLS. Stay. Away. From. My. Sister. How are you? Sorry it's been a while since I last wrote, I was amnesiac on a fishing vessel and then had to get exorcised. Quite well. How was the fishing? My favorite Jim Hammond in uniform image. 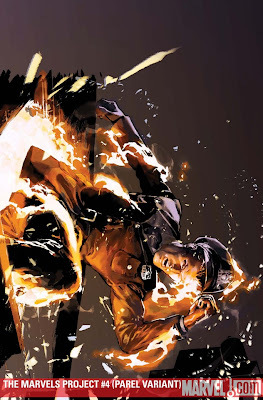 This is my favorite image of the original Human Torch in uniform. 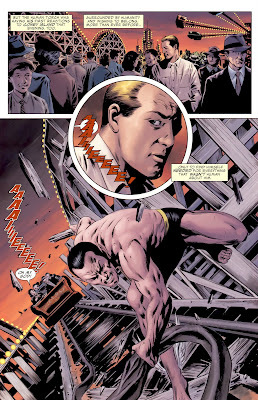 I like the mid-change effect, and the face Parel draws on Jim. It has been the background on my computer for a few months, and I actually went so far as to inquire about the cover when ordering the comics. I almost never do that, but I like this image that much. (My retailer didn't get that particular variant, though.) I hope some day it gets offered as a poster. One of the annoying things about being on another continent is that your timezone is shifted from everyone else's. This makes things like Birthday phone calls difficult to accomplish. So, in lieu of the traditional phone call I would like to instead send a Birthday Blog Post to Papa the Foul. 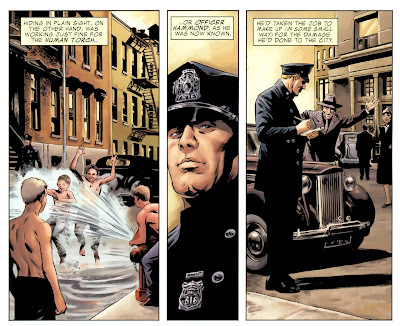 As a present, here is an in-uniform image of my current favorite among superhero cops: The Original Human Torch. And for good measure, here are some pages of him on his day off. Fortunately, Jim is a speed-welder in the off hours, and was easily able to stop the car. But the rest of his day off went pretty much as you'd expect. Hope your leisure time is a little better than Jim's, Dad.